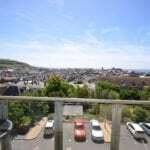 8 bedroom, all en-suite Edwardian Detached Town house having sea aspect & 4 reception rooms which incorporates a self contained 2 bedroom ground floor flat. Private parking. Enclosed courtyard: Kitchen: Laundry room: conservatory: 50m from beach. Full gas central heating & uPVC double-glazing. HALL: Imposing with Milton style tiled floor. Moulded cornice. Picture rail. Dado rail. Double central heating radiator. Pitch pine staircase. MUSIC ROOM/STUDY 14′ x 12′ (4.27m x 3.66m) Large window. Moulded cornice. Picture rail. Double central heating radiator. BEDROOM 15′ x 14′ (4.57m x 4.27m) Bay window with bench seating and sea views. continuation of Oak floor. Two double central heating radiators. Original fireplace surround. BATHROOM 8′ x 5′ 7″ (2.44m x 1.7m) White suite comprising large walk-in shower. Vanity wash hand basin. Low flush WC: Chrome heated towel rail. Tiled wall areas. Extractor fan. BEDROOM 11′ 4″ x 12′ (3.45m x 3.66m) Wow effect laminate floor. Original fireplace surround. Double central heating radiator. Alcove cupboards. CONSERVATORY DINING AREA 7′ 8″ x 16′ 9″ (2.34m x 5.11m) Wood effect laminate floor. Double central heating radiator. KITCHEN 20′ x 8′ 2″ (6.1m x 2.49m) Quality fitted base and wall units with granite work tops. Inset sink. Inset hand sink. 5 gas hob with electric oven under and extractor over. 2 dishwashers. American style fridge/freezer. Breakfast bar. French doors to court yard. Ceramic tiled floor. Double central heating radiator. LAUNDRY ROOM 9′ 3″ x 7′ 4″ (2.82m x 2.24m) Ceramic tiled floor. Central heating radiator. Open shelving. Door to rear side and parking area. BEDROOM 1 15′ x 8′ 6″ (4.57m x 2.59m) Two windows. Double central heating radiator. EN-SUITE Bath with shower mixer over. Pedestal wash hand basin. Low flush WC: Central heating radiator. Tiled wall areas. FRONT LANDING Double central heating radiator. Moulded cornice. Picture rail. Pine staircase. Panelled doors off. BEDROOM 2 12′ x 12′ (3.66m x 3.66m) Feature original fireplace. Hanging closet. Moulded cornice. Picture rail. Double central heating radiator. EN-SUITE 9′ x 5′ 6″ (2.74m x 1.68m) White 3 piece suite comprising bath with shower mixer tap. Pedestal wash hand basin. Low flush WC: Central heating radiator. EN-SUITE 6′ 10″ x 5′ 4″ (2.08m x 1.63m) Power shower cubicle. Low flush WC: Pedestal wash hand basin. Central heating radiator. Ceramic tiled floor and wall areas. BEDROOM 4 14′ 8″ x 14′ 3″ (4.47m x 4.34m) Original fireplace. Moulded cornice. Picture rail. Double central heating radiator. EN-SUITE 8′ 4″ x 4′ (2.54m x 1.22m) Power shower. Pedestal wash hand basin. Low flush WC: Central heating radiator. Ceramic tiled floor and walls. BEDROOM 5 13′ 10″ x 17′ 6″ (4.22m x 5.33m) Sea aspect. Original fireplace. Double central heating radiator. Moulded cornice. Picture rail. EN-SUITE 6′ 6″ x 6′ 6″ (1.98m x 1.98m) Power shower. Pedestal wash hand basin. Low flush WC: Central heating radiator. Ceramic tiled floor and wall areas. BEDROOM 6 12′ 6″ x 12′ (3.81m x 3.66m) Central heating radiator. EN-SUITE 6’2 x 6′ Power shower. Low flush WC: Pedestal wash hand basin. Central heating radiator. Ceramic tiled floor and wall areas. BEDROOM 7 13′ x 15′ 3″ (3.96m x 4.65m) Double central heating radiator. EN-SUITE 7′ 4″ x 6′ 6″ (2.24m x 1.98m) Bath with shower mixer tap. Low flush WC: Pedestal wash hand basin. Central heating radiator. Ceramic tiled walls & floor. BEDROOM 8 13′ 9″ x 18′ 4″ (4.19m x 5.59m) Sea views. Double central heating radiator. EN-SUITE 7′ 9″ x 5′ 2″ (2.36m x 1.57m) Power shower. Low flush WC: Pedestal wash hand basin. Central heating radiator. Ceramic tiled floor and wall areas.